This Gary Player Signature course was built on the historic Longwood Plantation, whose heritage as a successful antebellum rice plantation along the majestic Waccamaw River accounts for much of its charm. 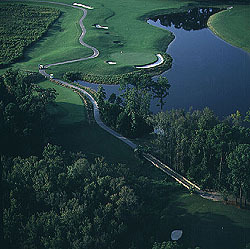 The 18 championship holes features flowing lakes, moss-draped oaks, lofty pines, and ever changing cypress. Attention to detail is noticeable from tee to green. For cold weather play, the course is kept green from tree line to tree line to give a refreshing view for those from snow covered northern climates. Unparalleled fairways focuses your attention on one hole at a time. Be sure to study the course layout, since several blind shots to the green will challenge your perception.